Hop on over to Imagination, where you can build anything you want with Lego bricks! Test your Lego creation's structure and stability on the earthquake table! Skip the lines with the Klook exclusive Hero Access Pass and enjoy a RM10 discount on meals purchased within the park or enjoy an exclusive VIP experience! klook voucher is easy to use. encounter no problem. but water park is rather small; theme park ok. can do 2 parks in one day. 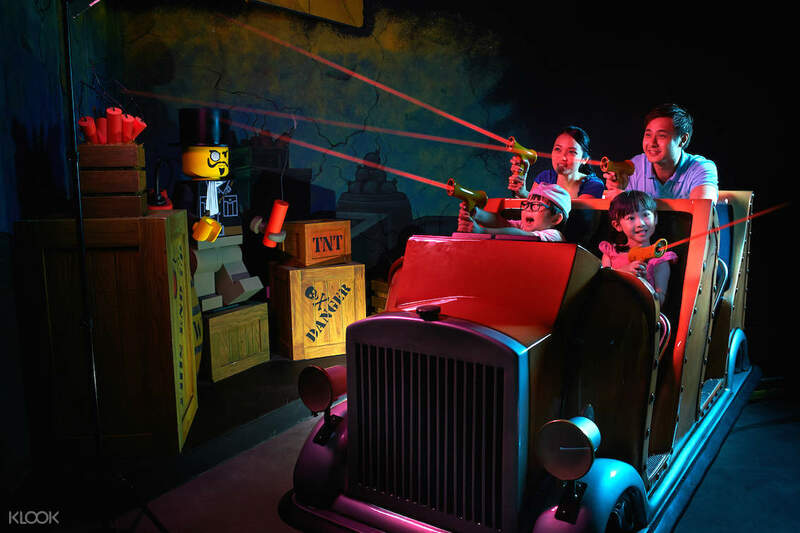 Enjoy the world of Lego with the whole family with this ticket to Legoland, Malaysia's first international theme park! Feed your imagination in the world of interlocking bricks, and see them craft amazing worlds constructed entirely out of Lego! There are multiple zones to explore, each with their own theme, and a huge array of theme park rides, waterpark areas, and building areas with Lego. See the Lego Ninjago World where you can put your ninja skills to the test, Miniland where you'll see the world's famous landmarks recreated in small scale using Lego, imagination land where you can build and test your own Lego buildings, Lego Technic for the most incredible rides and Lego workshops, and so much more! There's something for visitors of all ages in this amazing Lego park, so it's the perfect way to spend a day of fun, adventure and creativity with the whole family. 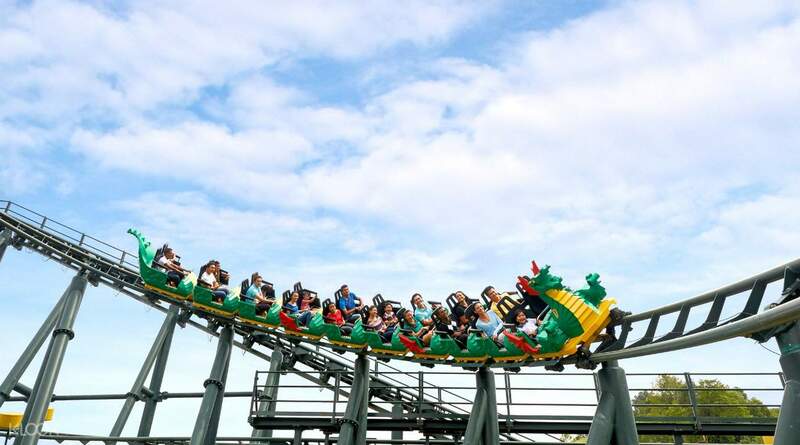 Head to the incredible Legoland in Malaysia, the first within Asia! 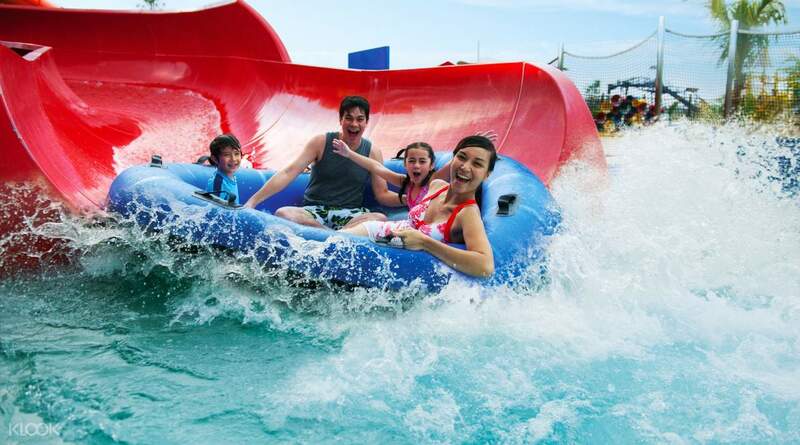 Head to the waterpark for thrilling water-based activities and more! Very good deal by Klook, we bought a 2-days multiple entry tickets for both parks (dry and wet park). We enjoyed the dry park a lot, plenty of rides but more suitable for kids of 110cm and above (more rides for them). Have a look at the Legoland website to find out more on the height requirements for their rides. Waterpark is just so-so, as we have been to Sunway Waterpark in KL numerous times we can’t help but to compare both waterparks and their rides and Sunway is far more fun. Legoland Waterpark is fun in its own way though, lego bricks big n small everywhere in the water (lazy river), but the wave pool was bad, we asked the staff what time is the wave he told us 4.30pm-5pm but we stayed from 4-6pm and there was not waves. When we asked again he just shrugged us off. We’ll be back for dry park again for sure but not Waterpark :) Thank you Klook for the great deal! Entry to park was an ease, just bought tickets at entrance and scan the bar codes. Very good deal by Klook, we bought a 2-days multiple entry tickets for both parks (dry and wet park). We enjoyed the dry park a lot, plenty of rides but more suitable for kids of 110cm and above (more rides for them). Have a look at the Legoland website to find out more on the height requirements for their rides. Waterpark is just so-so, as we have been to Sunway Waterpark in KL numerous times we can’t help but to compare both waterparks and their rides and Sunway is far more fun. Legoland Waterpark is fun in its own way though, lego bricks big n small everywhere in the water (lazy river), but the wave pool was bad, we asked the staff what time is the wave he told us 4.30pm-5pm but we stayed from 4-6pm and there was not waves. When we asked again he just shrugged us off. We’ll be back for dry park again for sure but not Waterpark :) Thank you Klook for the great deal! Entry to park was an ease, just bought tickets at entrance and scan the bar codes. There are lot of building made by lego in the park. Malaysia KLCC, China Templer, airport, shipping and ect....The small kid enjoying boat and driving the lego car. My kid said had a lesen can drive now. When tried can try up to the tower you can had a good view of the hold legoland and the ninja go had the motion car when string the hand, it was very tried.play ground was the kids lover and the movie also. There are lot of building made by lego in the park. Malaysia KLCC, China Templer, airport, shipping and ect....The small kid enjoying boat and driving the lego car. My kid said had a lesen can drive now. When tried can try up to the tower you can had a good view of the hold legoland and the ninja go had the motion car when string the hand, it was very tried.play ground was the kids lover and the movie also. My daughter love it very much.The game was fun and excited for her and they play again and again with hero pass and no need to line up.they can choose the seat by them self it just that the entrance of hero pass no very clear.First we miss out the entrance and line with others wasted the time. Actually just need to walk into the exit entrance and show the tag then we can play in advance. Lot of people dun know and score us cus we are not in the line.It had the lego show end of the day. My daughter love it very much.The game was fun and excited for her and they play again and again with hero pass and no need to line up.they can choose the seat by them self it just that the entrance of hero pass no very clear.First we miss out the entrance and line with others wasted the time. Actually just need to walk into the exit entrance and show the tag then we can play in advance. Lot of people dun know and score us cus we are not in the line.It had the lego show end of the day. Interesting place for family to visit.Not crowded and well organized. The Q is quite reasonable and convenience. The Ninja Lego is most relax indoor activity and exciting to play with children. Is very memorable to family especially kids. Worthy to visit, and hope that more new things coming in future. Interesting place for family to visit.Not crowded and well organized. The Q is quite reasonable and convenience. The Ninja Lego is most relax indoor activity and exciting to play with children. Is very memorable to family especially kids. Worthy to visit, and hope that more new things coming in future. Great experience for the entire family. Just presented our mobile tickets at entrance and was scanned through immediately. Very less lines so got to do most of rides. Do not buy the fast pass until you get there and assess the situation. Great experience for the entire family. Just presented our mobile tickets at entrance and was scanned through immediately. Very less lines so got to do most of rides. Do not buy the fast pass until you get there and assess the situation. The day we went there was not many people. We waited 5min or less for most rides. Our kids 9 and 6 had a blast. We also went to the water park and the kids went on almost every ride. Would recommend the family with kids. The day we went there was not many people. We waited 5min or less for most rides. Our kids 9 and 6 had a blast. We also went to the water park and the kids went on almost every ride. Would recommend the family with kids. 1. booking yr ticket early better than walking in..👍.. 2. i got ticket with less price thru klook by using voucher diskaun. 😍 3. its fun n 1dy not enough times to explore everytg inside. 4. only their food not my taste n not recommended. also the price. 1. booking yr ticket early better than walking in..👍.. 2. i got ticket with less price thru klook by using voucher diskaun. 😍 3. its fun n 1dy not enough times to explore everytg inside. 4. only their food not my taste n not recommended. also the price. From the start it was a good experience. Getting the tickets via KLOOK was a breeze. ive used them 3 times now after a friend recommended them to me. Lego was as i expected. Heaps of fun. its quite compacr which is great. We got the combo ticket and went to the water park 1st as a thunder storm was predicted around 3. You can go between the 2 parks easily as many times as you want with the combo ticket. Just shiw the QR code each time. From the start it was a good experience. Getting the tickets via KLOOK was a breeze. ive used them 3 times now after a friend recommended them to me. Lego was as i expected. Heaps of fun. its quite compacr which is great. We got the combo ticket and went to the water park 1st as a thunder storm was predicted around 3. You can go between the 2 parks easily as many times as you want with the combo ticket. Just shiw the QR code each time. it was a very smooth purchase and an seamless entry in the park. no questions asked but the staff. also the staff was very helpful. liked the klook experience very much. have also booked my universal Singapore tickets on klook now. it was a very smooth purchase and an seamless entry in the park. no questions asked but the staff. also the staff was very helpful. liked the klook experience very much. have also booked my universal Singapore tickets on klook now. Q: For the 2 Day Combo (Theme Park + Water Park) tickets, can I use the ticket before the validity period ends, and use it on 2 consecutive days? A: Yes, you can, but please note that you cannot start day 1 on the date of expiry. For example, if your ticket expires on 2 September, then first day of entry must be on or before 1 September.